National Theatre of the Deaf perform in sign language, bringing to light the powerful visual language. 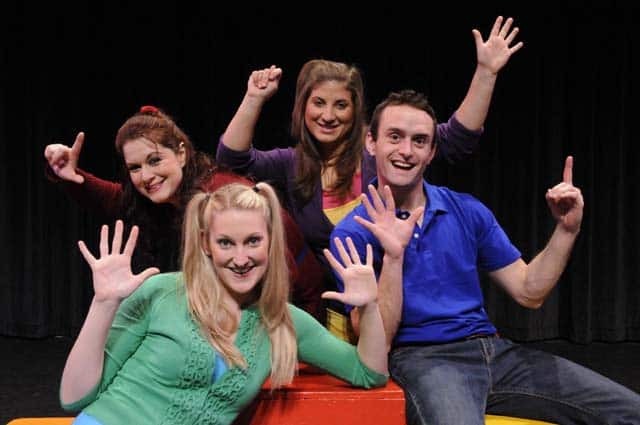 Friday, Feb. 12 at 10 a.m. — RANDOLPH — On Friday, Feb. 12 at 10 a.m., the National Theatre of the Deaf performs “It’s in the Bag” for grades K-6 at the Chandler Music Hall in Randolph. All seats are $6, and the production is open to the public. By placing sign language on stage, the National Theatre of the Deaf (NTD) showed the world that it was a beautiful, powerful, visual language. The NTD company began in 1967, when resources for the deaf population were scarce. The lighting designer of “The Miracle Worker,” produced in 1950 on Broadway, birthed the idea for NTD. It took nearly 10 years to gain the funding and interest needed to launch NTD’s first productions, but audiences were amazed at the beauty, depth, and range of material that was performed. By showing the value and talent of the deaf artist, the NTD also showed the value and talent of the deaf individual. NTD became a catalyst for change, as theatergoers are often influential and public spirited citizens. Deaf people also became more empowered. By affecting our audiences, NTD proved and still proves its ability to be a catalyst for social change. Through its art, the National Theatre of the Deaf has created profound social change. Through its art form, doors began to open for the deaf population at large. The magic of it all has been the National Theatre of the Deaf’s remarkable ability to entertain and inform at the same time. NTD’s production of “It’s in the Bag” features the Paper Bag Princess by Robert Munsch. Audiences discover a mystery story, fables, tangram puzzles, and much more! Starting with “Using Your Noodle,” the National Theatre of the Deaf improvises with simple pool noodles to show signs to learn and enjoy. Have fun with NTD as they combine the visually exciting American sign language with the spoken word to create a performance that will be seen, heard, and long remembered. Tickets for this event are available online at www.chandler-arts.org or by calling the box office at 802-728-6464 weekdays between the hours of 3 and 6 p.m. This event is presented by Chandler Center for the Arts. Chandler Music Hall is fully accessible and equipped for the hearing impaired. Chandler Center for the Arts is located at 71-73 Main Street, Randolph.